Whether building a new home or considering a facelift on an existing home, there are midrange improvements that you can take to the bank. Knowing which ones provide the best return on investment (ROI) will make selling time more profitable. 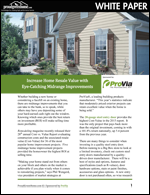 This white paper identifies some of the top midrange home improvement projects that make your home stand out and give you the highest ROI at selling time.